Terrence Malik’s latest film has been the source of a great deal of controversy, provoking sharply divided opinions. (Several days ago, a friend of mine posted on Facebook about how much he hated it.) My own feeling immediately after watching this film was similar to how I felt after watching Enter the Void, which was that what I had just seen was perhaps too much to absorb in a single viewing. There are many different kinds of images in this film, and their meanings and connections to one another are not always clear. Malick seems to be using them to try to convey philosophical and possibly even religious ideas. The film ends with a scene of Jack wandering on a beach, where he meets his parents and other people from his past. No doubt this represents Jack’s reconciliation with his past. 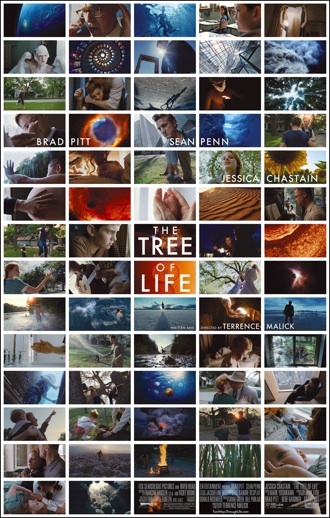 The Tree of Life is a great film. It shows that cinema can be more than just a storytelling medium. It can also be meditative, evocative and impressionistic. Films can challenge us and make us think as well as entertain us. I highly recommend seeing this film. This entry was posted on July 4, 2011 at 6:42 am and is filed under Cinema. You can follow any responses to this entry through the RSS 2.0 feed. You can leave a response, or trackback from your own site.